Ingrid Nilsen Photos, News, and Videos | Just Jared Jr.
Tyler Oakley Kicked Off the Holiday Season By Helping Others! Tyler Oakley kicked off the holiday season by helping those in need! The social media star decided to invite some friends to L.A. Kitchen, a local soup kitchen, to help make meals for people in their community. Tyler teamed up with Joey Graceffa, Kingsley, Ingrid Nilsen and Alex Wassabi to put together some tasty meals. “I feel if we’re hanging out, catching up, we might as well be doing some good!” Tyler explained. If you’re connecting with friends over the holiday season, we recommend seeing if you can help out at a local soup kitchen or food bank. Find out how you can get involved in your community at volunteermatch.org! We absolutely love that Bonnie Wright and Evanna Lynch, who played Ginny Weasley and Luna Lovegood, came out to support the world premiere of Fantastic Beasts and Where to Find Them! The two Harry Potter alums made sure to take some selfies for social media for all the fans, all while supporting author J.K. Rowling at the premiere of the movie. 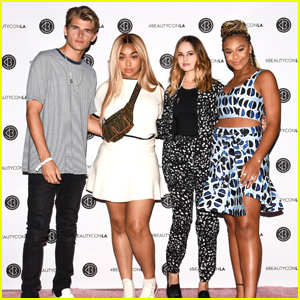 Social stars Tyler Oakley and Ingrid Nilsen, plus Ezra Miller and Zoe Kravitz also hit the premiere in New York City last night (November 10). Ingrid Nilsen picks up of supplies for the DoSomething Power to the Period Drive. The 27-year-old YouTube star has teamed up with DoSomething.org, Holly Sanchez, and the U by Kotex brand for the national drive. Power to the Period aims to provide period products for many of the 3.5 million Americans who experience homelessness each year by encouraging people to collect and donate extra packages of period products to homeless shelters from now until September 30th — and it all started with a TWEET from Holly. Check out the PSA below! Join Ingrid Nilsen In The Largest Period Products Donation Drive. EVER!